Dynamic robot with attitude. Roborapter has real walking and running action with realistic neck and tail movement. His advanced personality has 5 distinct moods, hunting, docile, angry, cautious and playful.His twin touch sensors and IR vision for obstacle avoidance ensure he reacts to his environment. Batteries required. 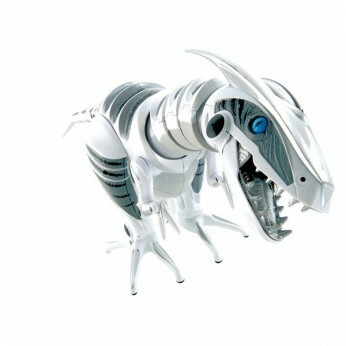 This toy costs approximately £64.99 (for the latest and best prices make sure you check our retailer list for the Roboraptor above). In our review of Roboraptor we classed it as being suitable for ages 6 years, 7 years, 8 years but recommend you check the manufacturer specific advice before purchasing.